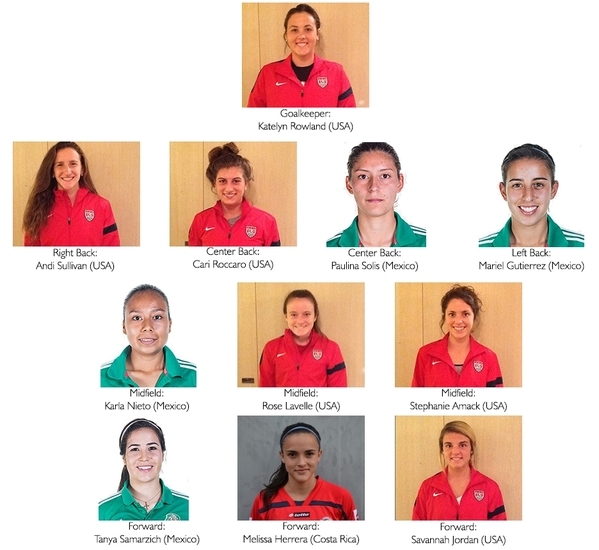 [CONCACAF UNDER-20 WOMEN'S CHAMPIONSHIP] Wisconsin freshman Rose Lavelle was named the winner of the Golden Ball as the top player at the Concacaf Under-20 Women's Championship in the Cayman Island. She was one of six Americans named to the tournament's Best XI. USC's Tanya Samarzich was one of four Mexicans name to the team. Besides Lavelle, other Americans on the all-tournament team included SA Freshman of the Year Savannah Jordan, Stephanie Amack, Cari Roccaro, Andi Sullivan and Katelyn Rowland. Jordan, Rowland and Roccaro were all members of the 2013 SA MVPS second team. Sullivan, who plays for Bethesda SC, is the only high school player on the U.S. team. She will enroll at Stanford in the fall. Samarzich was one of 10 Mexicans who play on U.S. pro, college or club teams.